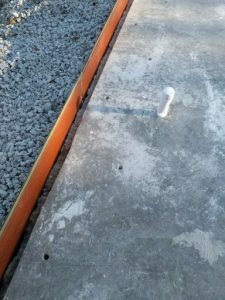 After Jason Hutto – our concrete contractor – came back and poured the driveway and ramps for the garage, the first thing I did was bury 6″ perforated pipe along the edges of the driveway, and along the sides of the building leading to outlets on the downhill end. I knew drainage would be critical, because the steel arch design doesn’t allow for installation of gutters at the eaves to carry rainwater to downspouts and away from the building. Once the pipe was buried and connected in with the drainage pipes for the barn, I ordered in a load of 1.5″ drainage rock and spread it around the building. It was at this point that I cleverly ran over with the tractor the electrical and water service conduits I had cast into the foundation slab. Thankfully, I was able to repair the electrical conduit, but the water is another matter yet to be resolved. 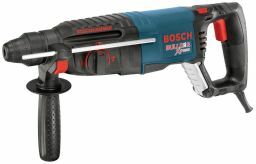 With the drainage system in place, it was time to lay out the Industrial Base Connectors and begin drilling the holes for the anchor bolts with my brand new Bosch hammer drill purchased just for the occasion. The exact placement of the IBCs is critical. They must be set the correct width apart in order for the walls of the building to be plumb. 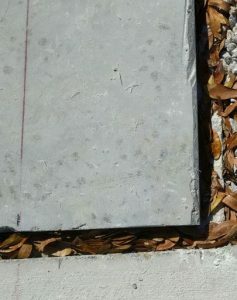 The slab upon which they rest must be perfectly level, and the ends must be aligned so that the base of the building is square. That way, there won’t be any issues bolting the arches together as they go up. Unfortunately, after laying out the IBCs, I realized we had a problem. Although Jason and his guys had poured the foundation almost perfectly (all dimensions exactly correct to within 1/8″!) in accordance with the spec, the plan had failed to take into account the depth of the drip edges on the IBCs. The outer edges of the IBCs are beveled downward at a 45º angle to allow for runoff. 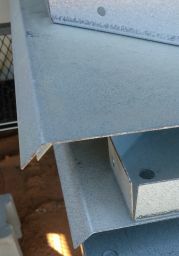 The height and depth of this edge is 1.5″ on the arch IBCs, and 1″ on the endwall IBCs. 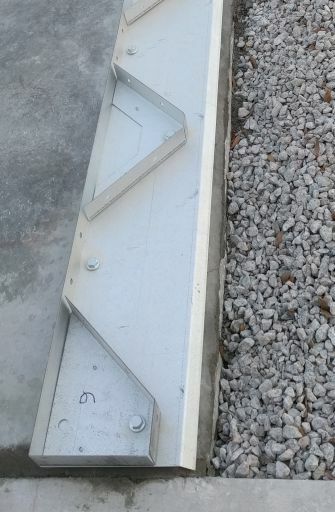 Even though the length and width of the foundation pour were almost exactly correct, I would have either had to move the IBCs out by the depth of their drip edges, or install them in the correct position without the drip edges hanging over the side of the slab. I called up the Steelmaster engineering support people and asked what to do. They told me that moving the IBCs was not advisable, because the arch walls would no longer be plumb, and that would not only impact the load-bearing strength of the building, but also make bolting the arches together and tying them down to the IBCs virtually impossible. I didn’t want to install the IBCs without the overhang, because that would have bent them upward causing water to pool at the base of the arches, and likely making it more difficult to install the concrete anchor bolts properly, and to bolt the arches to the IBCs. I decided I’d need to cut a bevel into the edge of the foundation. I could have done it myself, but I called up Jason to ask him to do it for me. His suggestion was to use his walk saw to cut a 1″ deep groove into the slab 1″ from the edge, and then knock off the top of the edge with a sledge. Although he had poured the foundation perfectly to spec, on time, and at a fair cost, he very graciously came out after work one day and made that cutout without charge. I can’t recommend Southern Footings in Williston, SC highly enough! It was such a pity to have to mangle up his beautiful pour to accommodate an oversight on the part of the designers. As you can see from this picture, I did have to take an additional 1/2″ or so off the top in some places, even after Jason cut the notch out. After mangling up that beautiful pour to accommodate the IBC drip edges, I placed the IBCs into position and drilled the anchor bolt holes. Before bolting the IBCs down, I placed grout underneath them into the notch Jason cut for me. That way, water will not pool up underneath the IBCs and create a breeding ground for mosquitoes or seep into the cracks and freeze in the winter.